Chilly nights are here….winter is on the way. What to eat that is warm and yummy for breakfast? I bought some instant GF oatmeal at the health food store. It was pretty tasty and got me thinking that maybe I could make my own version which could be a lot cheaper and easily varied. I looked around on some sites and cookbooks. I found one by the queen of entertaining, she who spent a few weeks in the big house. No names here! All I had to do was use gluten free oats which are available at Freys Better Foods, at Giant and at Wegman’s grocery store. There was a bit of prep work; the oats need to be toasted for 15 minutes which gives them a lot more flavor than the ancient grains version I had purchased. A sheet pan is perfect for this toasting. Just keep an eye on it for the last few minutes to make sure nothing gets too brown. I put some dried cranberries and golden raisins in my version. Other options could be chopped dried fruits like apricots or apples, pumpkin seeds, sunflower seeds, flax seeds, or any sort of nut you like. I think a combo of two items is really a great idea. Like some fruit and some nuts. I like dried cranberries and sunflower seeds. I have also topped mine once it was cooked, with some hemp seeds which are nutty and kinda like sesame seeds. 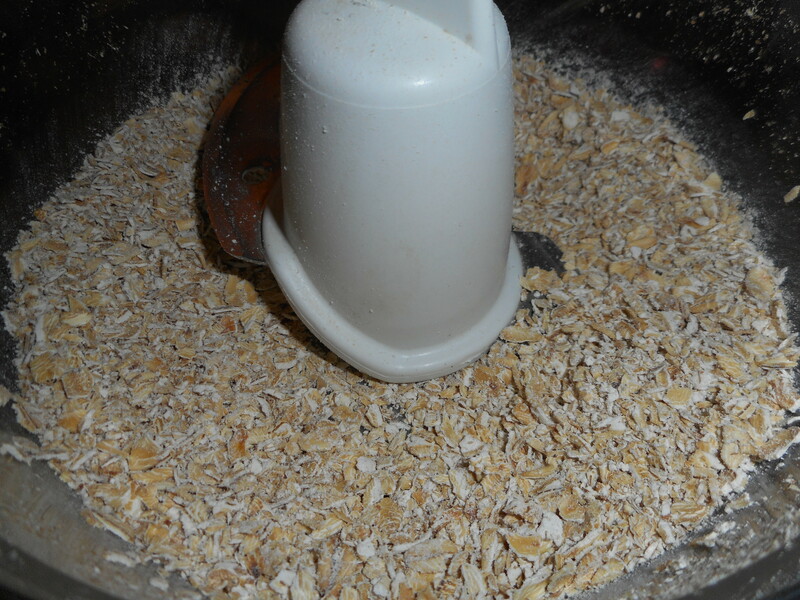 The oats were coarsely ground in my small food processor in two batches. If you use a big one you could probably do it in one batch. I poured the chopped oats into a storage jar with a tight lid and added the sugar, salt and cinnamon. Then I poured in the toppings. Easy and it only takes a few minutes to make it in the morning. Preheat oven to 350 degrees. 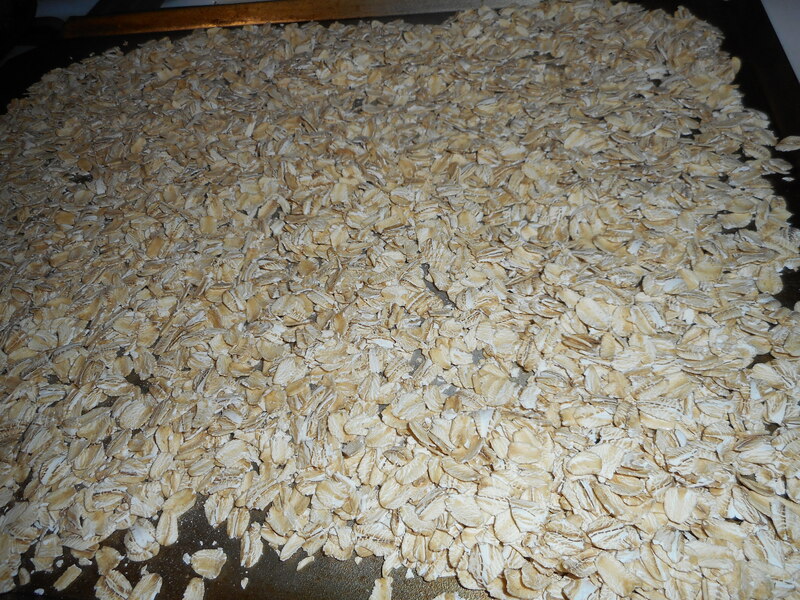 Spread oats on a rimmed baking sheet; bake until lightly toasted but not browned, about 15 minutes. Let cool. Pulse oats in a food processor until coarsely chopped. Mix sugar, salt, and cinnamon, or more to taste into the oats as well as half to 2/3 cup of a combination of add-ins (see suggestions below), before storing in an airtight container for up to 2 weeks. Or freeze it to keep even longer . Additions: dried cranberries, pumpkin seeds, walnut chunks, pecan bits, raisins, dried apricots cut into small bits, currants, dried blueberries or cherries, flax seeds, hemp seeds. To make: heat 2/3 cup of water, lightly salted, to the boil. Stir in a heaping 1/3 cup of the oatmeal mixture. Cook 2-3 minutes, stirring a couple times. Cover and let stand 2-3 more minutes before scooping the hot cereal into a bowl. It is already sweet enough for my taste but you can add more brown sugar or some honey to the dish. A fresh topping would be a great addition of nutrients and even more flavor. Sliced banana, some blueberries or sliced ripe pear and you are about to enjoy a fairly inexpensive yet healthy gluten free hot breakfast that only took 2 minutes to cook. Note added December 2015: I made a batch recently and baked it extra browned but when I tasted it the flavor in a bowl of cooked oatmeal it was lovely; roasty dark and full of toasty oaty goodness. So if it gets dark, still grind it up and test it; you may love it! Originally published in this blog November 2014. 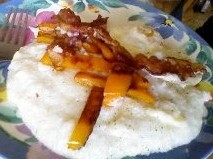 GF Breakfast Is Doable and Delish! Breakfast, well…that can be sometimes kinda problematic for us celiacs. No more raisin bran, no more cheerios, no more Great Grains cereal. What to do?? Well, there are a number of options, the Chex Family comes to mind for me: Rice Chex, Cinnamon Chex (my personal fav) and Chocolate Chex which is surprisingly good. Not many other mainstream GF cold cereals. I do hear that Special K is coming out in a GF version in a few months; can barely stand the wait; loved that cereal. Maybe they will even make a version with freeze-dried strawberry slices. I would be in GF cereal heaven! Anyway, back to reality; there is one gf flaked cereal I have found that floats my boat, Nature’s Path Organic Mesa Sunrise. It contains corn, flax, buckwheat, quinoa and amaranth. The flakes are crunchy and hold their own in milk for a few minutes, less sog than any other flakes I have tested. I buy them at Frey’s Better Foods, $9 for a big 26.4 oz bag, yes, that is a lot of moola but it is basically a double sized box making it $4.50 a box which is about what most gf organic cereals cost. I like it with hemp hearts sprinkled on top and some one percent milk poured in. The hemp hearts are nutty and crunchy, kinda like a less hard sesame seed. I keep them in the freezer so they stay fresh. I also prefer my homemade granola with pecans to any I have purchased since going gluten free. I love it sprinkled over applesauce and over organic yogurt. It is much more flavorful and it is not hard like pebbles as most GF granola seems to be. Not sure why they can’t make a decent gf granola to sell but I just make my own every few months and freeze most of it to eat later, stays fresh in my freezer. I made some today actually, do try it; you will not be disappointed. The recipe is in my archives. Hot choices: a few weeks ago I posted my new recipe for quick oats made out of GF rolled oats. I like it even better than the commercial Ancient Grains Oatmeal by purely elizabeth. Don’t get me wrong, I like their cereal but I think my own oats are toastier and fresher and I like the pure oat flavor as opposed to their blend of oats, quinoa, amaranth and chia. 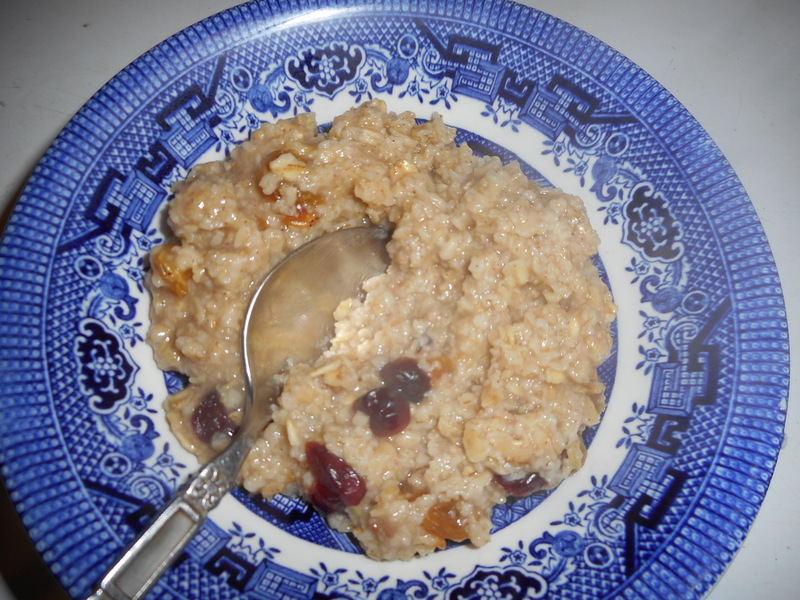 I also make old fashioned oatmeal the same way I have for years: boiled in lots of salted water which is drained off before topping with walnuts, dried cranberries, cinnamon, nutmeg and maple syrup: a superb combination of flavors. Last weekend I made some buckwheat pancakes. GF, yes; buckwheat is not wheat. It is not related at all. Actually in the same family as rhubarb, but you don’t eat the stems like rhubarb, the seeds are what manufacturers grind into buckwheat flour. The cakes were hearty and flavorful with maple syrup and a glass of milk. I also have a great recipe for cinnamon GF waffles which I often make for company, pretty much as good as wheat ones. 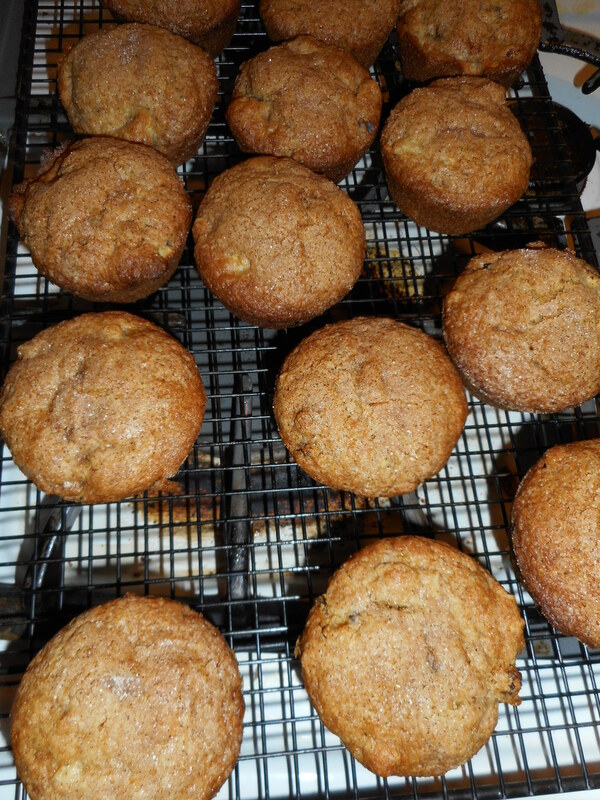 I make a bunch of different muffins, apple walnut, banana nut, carrot and raspberry coconut. They are all great for breakfast and can be frozen for a few weeks; just heat them in the microwave: instant breakfast. Of course, you can go for eggs. I like them soft boiled, scrambled, over easy and in an omelet. Last Sunday I made an omelet and stuffed it with two jumbo shrimp leftover from the night before, chopped them in chunks, draped them with a slice of provolone cheese which melted over it all. Wicked yummy that was! No toast needed either. Sometimes I make grits and stir in a handful of cheddar cheese when they are cooked and top it with a couple of over easy eggs sprinkled with green hot sauce. To kick it up even further; top it all with some sauteed peppers slices and a couple of slices of crisp bacon. Now that is some tasty meal, even grit haters might go for that combination! So don’t skip breakfast; there are some great gluten free options out there. Chilly nights are here….snow may be on the way. Yes, that sounds awful but it is the sad truth about fall…it means wintery cold is not far off. The freezing weather we are about to be hit with got me thinking about making more warm breakfasts. Last week I bought a bag of quick GF oatmeal at the health food store. It was pretty tasty and only took a few minutes to cook up. It got me thinking that maybe I could make my own version which could be cheaper and easily varied from batch to batch. I looked around on some sites and cookbooks. I found a recipe by the queen of entertaining, she who spent a few weeks in the big house. No names here! All I had to do was use gluten free oats which are available at Frey’s Better Foods, at Giant and at Wegman’s grocery store. I added a bit more cinnamon to my version. I put some dried cranberries and golden raisins in my version. Other options could be chopped dried fruits like apricots or apples, pumpkin seeds, sunflower seeds, flax seeds, or any sort of nut you like. I think a combo of two items is really a great idea. Like some fruit and some nuts. I also topped mine, once it was cooked, with some hemp seeds which are nutty and kinda like sesame seeds. The oats were coarsely ground in my small food processor in two batches. If you use a big one you could probably do it in one batch. I poured the chopped oats into a storage jar with a tight lid and added the sugar, salt and cinnamon. Then I poured in the toppings. Easy and it only takes a few minutes to make it in the morning. Preheat oven to 350 degrees. Spread oats on a rimmed baking sheet; bake until lightly toasted but not browned, about 15 minutes. Let cool. Pulse oats in a food processor until coarsely chopped. Mix sugar, salt, and cinnamon, or more to your taste into the oats as well as half to 2/3 cup of a combination of add-ins (see suggestions below), before storing in an airtight container for up to 2 weeks. Or freeze it to keep even longer. Additions: dried cranberries, pumpkin seeds, walnut chunks, pecan bits, raisins, dried apricots cut into small bits, cut up medool dates, currants, dried blueberries or cherries, flax seeds, hemp seed hearts: any small seed or dried fruit would be awesome! Note: I like this better than the GF Ancient Grains version; tastes fresher and toastier and has a great oaty flavor. About to make a new batch; I have been enjoying it a lot on cold mornings. I love how fast I can make it; my regular oatmeal takes 8 minutes plus the time to get the pot of water to a boil. Two minutes is an oatmeal revolution!